These Easter crafts are lots of fun and are perfect for the young ones because they’re adorable but super easy. If you’ve got spring fever and are ready to start crafting for Easter with your preschoolers, these will definitely get you started. 1. Paper Plate Bunny – Make a rabbit from a paper plate, pipe cleaners and a little paint or pieces of felt. 2. Invitation to Create – Offer your little ones art supplies and let them create whatever they’d like! From Buggy and Buddy. 3. Yarn Egg – After cutting paper into an egg shape, let your kids glue on colorful yarn pieces. When they’re done, cut off the excess for them. From Crafty Crow. 4. DIY Easter Basket – Teaching 2 and 3 Year Olds show us how take a simple paper bag and turn it into a festive watercolor egg collecting basket! 5. Playdough Bunnies – Use different colors of playdough to shape bunnies using a piece of string for whiskers. From Powerful Mothering. 6. Bunny Handprint – Dip your hands in paint and press them onto paper, adding bunny features after it dries. From Frogs and Snails and Puppy Dog Tails. 7. Egg Stamping – Use plastic eggs as stamps! Create fun and colorful patterned art work. 8. Toy Painting – Grab a few Easter wind up toys and dip their feet in washable paint. Then, wind them up and let them walk all over a piece of paper. From Tutus and Tea Parties. 9. 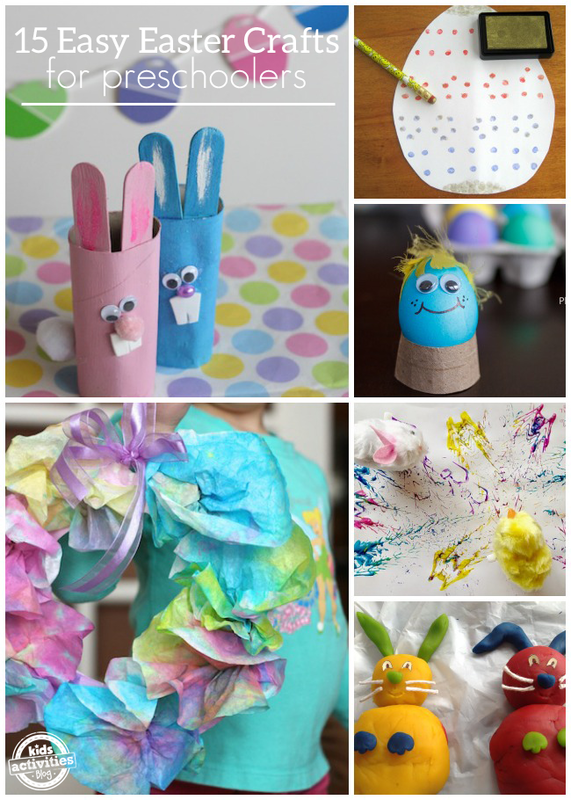 TP Roll Bunnies – Make these adorable Easter bunnies from an empty toilet paper like these from Happy Hooligans. 10. Egg Buddies – After you dye a few eggs, get creative by adding googley eyes and feathers to turn them into little buddies! From Plain Vanilla Mom. 11. Coffee Filter Wreath – Use a paper plate, some coffee filters and food coloring to make a festive Easter wreath like this one from Happy Hooligans. 12. Easter Egg Craft – Cut out paper in egg shapes and use a pencil eraser pressed onto a stamp pad to create a decorative pattern. 13. Texture Eggs – Give your kids different textures to glue to an egg shaped piece of paper. Try colorful buttons and pom poms. From No Time for Flash Cards. 14. Coffee Filter Eggs – Use this method of dying coffee filters from The Chocolate Muffin Tree and once they’re dry, cut them into egg shapes. 15. Handprint Chicks – Use your hands dipped in yellow paint to make a spring chick. Liz, thank you so much for including our watercolor Easter bags. This is a wonderful round-up!